Still rummaging through scraps and leftovers while I get 'back in the saddle' and acquaint myself with new studio space and layout. I can find most things within 1 - 3 tries. Improvement! 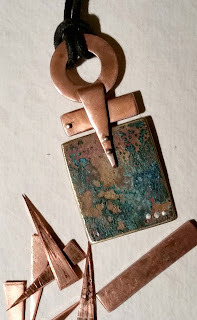 From the remnant pile - a copper washer, triangular copper cuttings, a thick copper bar, a heavily patina'd bit of brass and a 'just right' length of black cord. The copper bar had a small drilled hole so I riveted a head pin in it and did same on the attaching triangles and at the bottom. 1-2-3. These first two days helped me get going but am ready for something more interesting. From inside a nice, warm apartment though - until the outside temps reach the 30's at least. Oh yes here we go! Loveliness! Bobbi your an inspiration to us all. Beautiful.